Leprechaun is a series of horror comedy films consisting of eight films. Beginning with 1993's Leprechaun (filmed in 1991) the series centers on a malevolent and murderous leprechaun named "Lubdan" (although he never reveals his name), who, when his gold is taken from him, resorts to any means necessary to reclaim it. None of the series are in chronological order. Warwick Davis plays the title role in every film except for the reboot, Leprechaun: Origins, and the TV movie, Leprechaun Returns. In the reboot, Dylan "Hornswoggle" Postl, of WWE fame, portrays the creature and in the TV movie, the creature is played by Linden Porco. The first two films were theatrically released. After a disappointing gross from Leprechaun 2, Vidmark released Leprechaun 3 direct-to-video. The following sequels were all direct-to-video. In the original Leprechaun (1993), Daniel O'Grady (Shay Duffin) captures the Leprechaun (Warwick Davis) while in Ireland, takes his gold and smuggles it back to his home in North Dakota, unaware the Leprechaun has followed him. Confronting O'Grady and demanding his gold the Leprechaun is injured by O'Grady and sealed in a crate with a four-leaf clover, though before O'Grady can kill the creature he suffers a stroke. Ten years later the Leprechaun is accidentally released by Tory Redding (a then-unknown Jennifer Aniston) and her new friends, and goes on a killing spree in search of his gold, which Alex Murphy (Robert Gorman) and Ozzie (Mark Holton) had discovered. After the Leprechaun reclaims the bulk of his gold he is defeated when Alex shoots a four-leaf clover down his throat with a slingshot and Alex's older brother Nathan (Ken Olandt) blows up the well the Leprechaun falls into. In Leprechaun 2 (1994) the Leprechaun seeks out a new bride in modern-day Los Angeles, one thousand years after an earlier attempt to claim a bride was foiled. Claiming a fussy teenage girl named Bridget (Shevonne Durkin), the descendant of his original choice of a wife, the Leprechaun holds her captive in his lair and terrorizes her boyfriend Cody (Charlie Heath), who had taken one of his gold coins. In the end Cody saves Bridget and defeats the Leprechaun by impaling him with a spike made of wrought iron, one of the few substances that can harm a Leprechaun. Leprechaun 3 (1995) begins with the Leprechaun, having been changed into a statue by a magical medallion, being sold to a Las Vegas pawn shop. Assuming his original form when the clerk removes the medallion, the Leprechaun kills him and goes on a rampage through Las Vegas in search of one of his wish granting coins, which is passed from hand to hand. The Leprechaun is ultimately defeated by college student Scott McCoy (John Gatins) and Scott's new girlfriend Tammy Larsen (Lee Armstrong), who blast his gold with a flamethrower, causing it to vanish and the Leprechaun to burst into flames. Taking place in the future, Leprechaun 4: In Space (1997) has the Leprechaun abduct and begin courting snobbish alien princess Zarina (Rebekah Carlton), seducing her with promises of wealth. After being blown up by a group of marines who rescue Zarina, the Leprechaun is reborn on the marines' ship via exploding out of the groin of one of an unfortunate man, Kowalski. He then goes off in search of his stolen bride and gold, killing all those who get in his way. After being turned into a giant via an enlargement ray, the Leprechaun is ejected into space by the survivors of the massacre, Tina Reeves (Jessica Collins), Books Malloy (Brent Jasmer) and Sticks (Miguel A. Núñez, Jr.). Set in Compton, California, Leprechaun in the Hood (2000) has the Leprechaun being turned to stone once more, this time by pimp Mack Daddy O'Nassas (Ice-T), who uses the Leprechaun's mind-controlling magic flute to become a successful music producer. Years later, the Leprechaun is unknowingly changed back to flesh and blood by a trio of wannabe rappers led by Postmaster P. (Anthony Montgomery) who rob Mack Daddy, taking the Leprechaun's gold and the flute from him with the intent of using the objects to become successful. Hunted by both Mack Daddy and the Leprechaun, Postmaster P., after his friends and Mack Daddy are killed, is brainwashed into becoming a servant of the Leprechaun. Leprechaun: Back 2 tha Hood (2003) begins with the Leprechaun stalking Father Jacob (Willie C. Carpenter) trying to get his gold back, only to be dragged into the ground by demonic hands when the priest uses four-leaf clover laced holy water against him before dying from a heart attack. 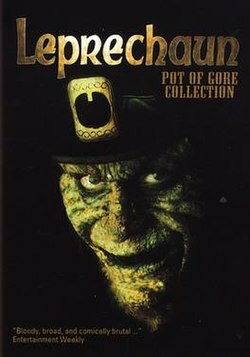 One year later the Leprechaun's gold is discovered by eighteen-year-old Emily Woodrow (Tangi Miller) and her friends, who use the gold to fulfill their wildest fantasies, unintentionally releasing the Leprechaun, who goes after Emily and the others to get his gold back, killing everyone who gets in his way. On the rooftop of the abandoned community centre Father Jacob had been building using the Leprechaun's gold Emily and her boyfriend Rory Jackson (Laz Alonso) defeat the Leprechaun by knocking him and his gold off the roof and into a pool of wet cement below, where the Leprechaun sinks and becomes trapped. The series has been released on DVD both separate and in collections. On September 30, 2014, the entire film series was released on Blu-ray for the first time in a box set titled ”Leprechaun: The Complete Movie Collection". Prior to the release of the original Leprechaun Trimark Pictures released an eight-page comic book prequel to the film. The story presented in the book is contradictory to the events of the film in several regards, such as depicting Daniel O'Grady as a lowly farmer and inhabitant of Ireland (instead of America) who obtains the Leprechaun's gold not by capturing the creature (as was stated in the film) but by following a rainbow. In 2008 publishing company Bluewater Productions announced that it would release a Leprechaun comic book series, which began in May 2009. Written by Zach Hunchar and illustrated by Kris Carter the first arc of the series follows the Leprechaun (who is revealed to be named Lubdan and is also the king and last of his species) as he battles rival race the Clurichaun and travels the world in search of his gold, which was stolen and auctioned off online, with the reluctant help of the geeky Ethan Thomas and his friends. With only four issues released, the series was seemingly cancelled, as no new issues have been announced. Micheal Kingston was slated to write the second arc of the series. Plans for a four-issue comic book crossover between the Leprechaun and Warlock series, which would have been written by Nick Lyons and released in late 2009, were made, but did not come to pass. It was revealed in March 2012 that Lionsgate and WWE Studios (who worked together on See No Evil and The Condemned) were teaming up to reboot the film series. Two weeks later, WWE.com unveiled a new video depicting Dylan Post (who works under a leprechaun gimmick in WWE as Hornswoggle) starring in the role as Lubdan. He announced via Twitter that it would come out in March 2013. Until May 2013, there were no updates on the film's progress. However, on May 28, 2013, it was reported that Zach Lipovsky, a visual effects supervisor and a finalist on the reality game show On the Lot was contracted to direct the reboot, now scheduled for screening in August 2014. The film was released under a VOD/Digital HD format on August 26, 2014 (following a limited release on August 22), with the DVD/Blu-ray released on September 30, 2014. Leprechaun Returns takes place 25 years after the original film. Linden Porco plays the title role, while Mark Holton reprises his role of Ozzie Jones from the first film. On November 16, 2018, Lionsgate announced the film would be released through digital and on demand on December 11. On March 17, 2019, Syfy premiered Leprechaun Returns along with their All-Day Leprechaun Marathon for St. Patrick's Day. ^ Mark Jones (Director) (1993). Leprechaun (DVD). United States: Trimark Pictures. ^ Rodman Flender (Director) (1994). Leprechaun 2 (DVD). United States: Trimark Pictures. ^ Brian Trenchard-Smith (Director) (1995). Leprechaun 3 (DVD). United States: Trimark Pictures. ^ Brian Trenchard-Smith (Director) (1997). Leprechaun 4: In Space (DVD). United States: Trimark Pictures. ^ Rob Spera (Director) (2000). Leprechaun: In the Hood (DVD). United States: Trimark Pictures. ^ Steven Ayromlooi (Director) (2003). Leprechaun: Back 2 tha Hood (DVD). United States: Lions Gate Entertainment. ^ "Leprechaun Merchandise". Connie's Warwick Davis Fanpage and Leprechaun Center. Archived from the original on February 17, 2009. Retrieved 2009-02-28. ^ "Bluewater Inks Deal With Lionsgate For Comic Series". Bluewater Productions. Archived from the original on 2009-01-05. Retrieved 2009-01-14. ^ "Bluewater Productions May 2009 Solic!". Bluewater Productions. Archived from the original on 2009-02-04. Retrieved 2009-02-20. ^ "Exclusive Interview: Warlock Writer Nick Lyons". Fangoria. Retrieved 2009-03-17. ^ "Lionsgate pacts with WWE on film deal". Variety. Retrieved 2012-03-15. ^ Moore, Trent (2018-03-17). "Leprechaun Returns in 2019 to SYFY. Watch teaser". Syfy. Retrieved 2018-03-20. ^ Ames, Jeff (2018-11-16). "Leprechaun Returns Trailer Goes Looking for a Pot of Gold". Comingsoon.net. Retrieved 2018-11-17. ^ "'Leprechaun' Marathon Airing on SYFY on St. Patrick's Day". Horror. Retrieved 2019-03-17. ^ "Leprechaun Movie Reviews, Pictures – Rotten Tomatoes". Rotten Tomatoes. Retrieved 2015-03-18. ^ "Leprechaun 2 Movie Reviews, Pictures – Rotten Tomatoes". Rotten Tomatoes. Retrieved 2015-03-18. ^ "Leprechaun 3 Movie Reviews, Pictures – Rotten Tomatoes". Rotten Tomatoes. Retrieved 2015-03-18. ^ "Leprechaun 4: In Space Movie Reviews, Pictures – Rotten Tomatoes". Rotten Tomatoes. Retrieved 2015-03-18. ^ "Leprechaun in the Hood Movie Reviews, Pictures – Rotten Tomatoes". Rotten Tomatoes. Retrieved 2015-03-18. ^ "Leprechaun: Origins – Rotten Tomatoes". Rotten Tomatoes. Retrieved 2015-03-18.